You may already know that Covenant Health employs more nurses than any other health system in our region. Did you also know that more than 450 Covenant Health nurses throughout our system have advanced nursing certifications? 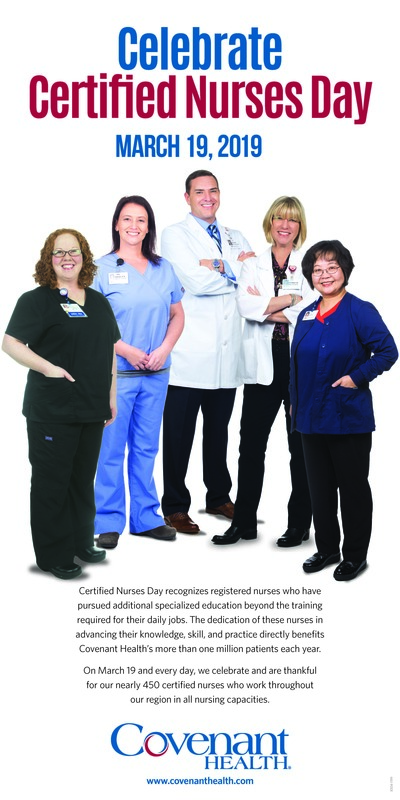 Each year on March 19, Covenant Health observes Certified Nurses Day by celebrating the achievements of our nurses who have pursued advanced training, completed rigorous examinations and received nationally recognized credentials in different specialty nursing areas. The celebration also highlights the opportunities available at Covenant Health to help nurses reach their highest levels of professional achievement and personal career satisfaction. As nurses progress through their careers, Honey said that ongoing professional education is an essential part of Covenant Health’s pledge of excellence, which focuses on always putting the patient first. For more information about nursing opportunities at Covenant Health, visit www.covenantcareers.com.